But good things come to those who wait, and finally the Ferengi DaiMon, Bok, unveils a surprise gift for Picard: his old command, the U.S.S. Stargazer. And it isn’t even his birthday. Bok claims the derelict starship is being presented to honor Picard as “the Hero of Maxia,” recalling a battle Picard barely remembers in which he destroyed a hostile Ferengi vessel—unidentified at the time—with a flashy bit of strategy still taught at Starfleet Academy, the Picard maneuver. Better yet, Bok is returning the Stargazer to the man who killed an entire Ferengi crew at no cost. What a bargain! Yes, this all makes perfect sense, so Picard accepts and can’t wait to get back aboard the ship he was forced to abandon so many years ago. Enterprise’s crack security team determines there is no danger on Stargazer and Picard beams over, even though his headaches are worsening and vivid flashbacks to Stargazer’s last battle now invade his waking thoughts. While examining the things he’d left in his old quarters, he fails to notice one small addition: a glowing orb in a trunk, which seems to trigger another severe headache. It matches the sphere that Bok is manipulating and cackling over on his own ship, like a deranged psychic with a crystal ball. Enterprise engages a tractor beam and starts towing Stargazer to a starbase, while the Ferengi tag along for some reason. Picard’s dreams are troubled by revived memories of the battle in the Maxia Zeta star system, visions of the Stargazer bridge burning around him and his crew. Riker is troubled when Data discovers that the Stargazer logs conflict with Picard’s official version of events: his final entry is a confession, in his own voice, that he destroyed the Ferengi ship with no provocation. This is a clear forgery, but they have two days to prove it before they hear back from Starfleet Command. Nonetheless, Picard becomes tortured with self-doubt and the voices and images in his head. Dr. Crusher has no choice but to knock him out with a tranquilizer and tuck him into bed. Bok continues to play with his shiny toy, strengthening Picard’s memories as he sleeps. “And now, dear Captain, you are ready to live the past,” Bok says to himself. “You will injure yourself as you once injured me.” It’s possible he doesn’t have Picard’s best interests in mind. Data and La Forge easily prove the log was doctored, and Dr. Crusher may have discovered something interesting and significant in Picard’s brain scan, but the captain dismisses everyone and orders Riker to release the Stargazer to conserve energy. Have you seen the monthly power bill for the Enterprise? Meanwhile, young Wesley has been noodling with the Enterprise’s sensors and violating doctor-patient confidentiality, so he is the only one who notices low-intensity transmissions coming from the Ferengi ship which match the anomalous patterns in Picard’s brain scan. Dr. Crusher reports this startling revelation to Riker, but it’s too late: Picard has beamed over to Stargazer, where Bok delivers a villainous monologue, powers up his sphere, and leaves a hallucinating Picard to reenact the Battle of Maxia with Enterprise in the role of the destroyed Ferengi vessel. Now that they’re looking for it, La Forge discovers another transmission from the sphere in Picard’s quarters. Data devises a defense to the “undefeatable” Picard Maneuver and Riker breaks through the captain’s delusion enough to get him to destroy the “thought maker” on Stargazer’s bridge with the phaser he apparently carries all the time. Boom! RIKER: Removed from command, sir. Placed under guard for his act of personal vengeance. Seems there was no profit in it. This episode is hampered by one significant flaw: it doesn’t make any sense. Picard might argue that revenge never makes sense, but Bok’s plan is more ridiculous than most, nearly on the order of luring Picard over to Stargazer with a barrel of Earl Grey and chaining him up behind a bulkhead. That might even be easier to accept than these thought makers that have supposedly been banned by the unscrupulous Ferengi—another bit of convenient alien technology with a baffling purpose. Move along, nothing to see here. Once again, the crux of the plot depends on the Enterprise crew being incompetent or acting unbelievably. It’s astonishing that the sensors on the ship are incapable of detecting an anomalous signal from inside, not to mention an approaching ship—until a smug schoolboy enhances their sensitivity. Not only is Wesley Crusher superior to every engineer aboard the ship, he also bests Starfleet engineers and the starship designers at Utopia Planitia! The moment Picard begins hallucinating that he’s back on his old ship, with accompanying head pain that causes him to periodically contort in agony and black out, it’s time to declare him unfit for duty and figure out what the hell is wrong with him, particularly considering the unusual timing of their Ferengi rendezvous. As you’d expect, Troi continues to be utterly useless in matters of the mind, which is, you know, her job. It’s at least gratifying to see Picard lecture Wesley on reporting his sensor discovery immediately through the comm, rather than delivering the message on foot to the Bridge. Maybe the eager ensign just wanted everyone to compliment his new outfit. 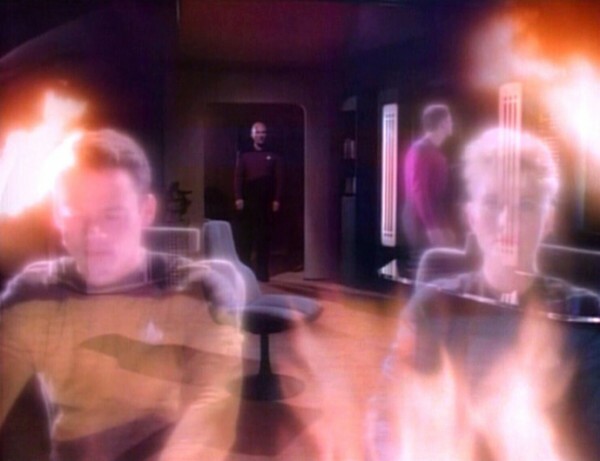 The oversight also may have been genetic, considering his mother makes the same mistake herself later in the episode; when Wesley enlightens Dr. Crusher about the captain’s brain wave patterns, she freaks out and decides to tell Riker right away… So she and Troi rush out of Sickbay to tell him in person, giving Picard just enough time to beam himself over to Stargazer. But most disappointing of all: No one thinks it’s strange in the first place that Bok wants to present the commander who destroyed a Ferengi ship with a prize to commemorate his “heroism”—especially for free. Has no one read the Aeneid? For the love of God, Montresor, beware of Ferengi bearing gifts! This whole episode feels drawn out and overdone, trying to engage the viewer with several contrived mysteries. What do the Ferengi want? What’s wrong with Picard? What really happened on Stargazer? But it also cuts all the tension by showing us the answer early on: Bok and his thought maker. The brief confusion over the forged ship logs seems unnecessary. What was the point? Did Bok intend it merely as a distraction? How much more interesting it would have been if he’d spent his life’s fortune on a good forgery, in the hopes of discrediting Picard and embarrassing Starfleet. The whole “You killed my son, now prepare to die” motif is clichéd and the plot is far too elaborate. I mean, why not just shoot Picard? And yet, I’ve always had a soft spot for this episode, because it reveals more of Picard’s background, shows us a new Starfleet design, and introduces the Picard Maneuver. But this time, I realized that the Picard Maneuver is as forced and ludicrous as the rest of the episode. It’s hardly the brilliant military tactic Starfleet makes it out to be, especially if they can come up with a defense against it in about ten seconds–even if it takes an android to do it and foreknowledge that the maneuver is about to be performed. (At least the solution didn’t come from Wesley this time.) Picard brushes it off with, “I did what any good helmsman would have done.” I don’t think he’s being falsely modest. He may not have known that the warp effect would confuse the enemy ship—he was just trying to surprise them and get to point blank range. Seems like someone at Starfleet simply fixated on it as the best idea ever, just like the writers. I also would have preferred that the “Battle of Maxia” be something that already plagued Picard’s conscience, a moment that defined his career and character, in the way that killing an entire crew and losing your first ship might. Instead, it takes Bok to dredge the memories up to the surface and force him to confront them, except not really. I don’t know why I keep getting these Ferengi episodes to review, but I suspect it’s Torie’s revenge for some past re-watch I inflicted on her. Thread Alert: This is not the worst thing Wesley has ever worn, but it isn’t good either. It looks like he asked someone to make him a Starfleet costume for Halloween. With rainbows. Best get used to it–we’ll be seeing him in this outfit a lot. Do you think he has just one that he washes often, or a whole closet of them? RIKER: Is second-hand merchandise. You wouldn’t want him. Trivia/Other Notes: Bok will return with another hackneyed revenge plot in the seventh season episode “Bloodlines,” bringing the series full circle: from crap to crap. Fans commonly refer to Patrick Stewart’s trademark tug at the bottom of his uniform tunic, usually when rising from a seat or making a decision, as “the Picard maneuver.” It would make a much better focus for a Starfleet Academy class, but of course we’ll have to wait until season 2 before we can see it in action. This episode would have sucked no matter what, but I think it was further hampered by our first encounter with the Ferengi. There might have been some sense of menace from Bok if his entire species hadn’t already been established as ridiculous. I find it hard to be frightened by an enemy that can be incapacitated by loud noises. The worst part, though, has to be Wesley spotting the similarity between Picard’s scans and the signal he detected. At a glance. Prefaced with, “I don’t know much about brain scans, but…” Wil Wheaton really tears apart this scene in his review of it. Wesley’s obnoxious comment when the doctor and Troi rush off to tell Rkier establishes him as a total brat. I think this might be the point where Wheaton finally understood all the Wesley haters and realized that he hated him too. Yeah… the thing with a lot of these first-season episodes, it seems to me, is that they had a potentially interesting idea — Picard has a history! It affects others! History comes back to haunt him! — that just got buried under layers and layers of needless complication that were both uninteresting and nonsensical. It’s like they were pursuing a plot bunny through the fields, blithely trampling over inconveniences like characterization and generally going with the first idea they came up with to solve any problems encountered along the way. Also, it really would help the Ferengi seem more menacing if they’d work on their posture a little. When you’re short already, the cringing monkey-men thing really doesn’t strike terror into the heart of anybody. I am 100% with Eugene here. He touched on all the notes I had. Bok actually managed to be menacing, for a little while, until he started jumping around. I did like the interplay between the two first officers, too. But the episode was dead to me as soon as Wesley “glanced” at the brain scans and figured out the connection (has NO ONE else noticed the crazy EM waves coming out of these spheres??). What really breaks this is the fact that Picard doesn’t seem remotely haunted by the Maxia incident. When Bok mentions it, Picard doesn’t even remember. It’s an “Oh, yes! Okay, that was a thing that happened.” If they had actually took the effort to demonstrate that Picard has always been haunted by this encounter, has always harbored some guilt, or at least still thinks of it as a possible failure or fault that he could have performed better on, it might have worked. At least Patrick Stewart got to act a little here, and his emotional journey was good–interesting, even–but entirely inexplicable, since his torment is entirely fabricated by one provably false audio recording. Also, isn’t it weird that neither Starfleet nor the Stargazer crew ever came back to claim their things (including the disabled ship and any technology it represents)? So no, it just doesn’t make sense. Warp 2. Oh, and as for punishment: I don’t even want to hear it, Eugene. I’ve already gotten “Code of Honor” and “Justice,” and I get to look forward to “Haven,” “11001001,” “When the Bough Breaks,” and “Skin of Evil.” I definitely got the short end of the Season 1 stick! Yeah, about that “Picard Y U NO REACTION” thing — you’d think that losing a ship and some part of your crew in a fiery inferno after an ambush from unknown faceless aliens that you were forced to kill off by the skin of your teeth, you’d think there’d be just, oh, a WEE bit of PTSD in all of that somewhere? Maybe? All the critques of this episode sound right on target to me. Man I hardly rememebr just how weak of a first season TNG really had. I do remember cool episode later on, but I can’t recall on with the *evil* captialist at a central element. I actually forgot to re-watch this last night and ending up watching bonus material from Superman Returns. I feel shamed for leaving Eugene and Torie to take this one on the chin alone, but hey man i’m no hero. @2 DeepThought: That’s a really good point about the timing. I’d berate the writers and producers for it more, but it’s something I see all the time in books. Nobody gets the passage of time right or thinks about how it would relate to the present. Kids’ ages are often the area of the worst offenses, but it’s everywhere and once you start to notice it, it’s impossible to stop. @3 Torie: Ah, but who got stuck with “Angel One”? That’s definitely worse than “11001001”, though it would offer an excellent opportunity for one of your special rants. When you get right down to it, the season 1 stick doesn’t have a long end. @5 Bob, that ‘s the season finale, “The Neutral Zone”. They find a sleeper ship and instead of a cadre of genetically-engineered supermen, they find a bunch of whiny people. The “evil capitalist” winds up being a marginally more annoying version of Thurston Howell III. Even the good episodes of season 1 are mostly near misses. If you set out, deliberately, to create a character more hate-able than Wesley, could you have done it? This episode encapsulates everything dislikable about the concept. For the TNG drinking game, I propose a drink every time Troi’s magic powers achieve completely unremarkable results—whether she “detects” the idiotically and inanely obvious child’s play or because observations *easily* within her described abilities elude her. That’s worth an entire drained bottle. Anti-capitalism. I suppose it is a logical consequence of replicator technology that essentially divorces the equations of supply and demand. One gets the sense that starships are capital projects, requiring some outlay or expenditure, but most of what goes on inside them is not. Given what ST posits about the 23rd Century, I imagine most of our worship of markets and money and interest-bearing bonds would seem as witchhunts and inquisitions do to us today—weird anachronisms of a more savage time. In all of Star Trek, is there ever even a mention of officers being paid or otherwise compensated for what they do? KIRK: “Scotty, You’ve earned you pay for the week!” — Star Trek –The Dommsday Machine. Set out to create a more hate-able character than Wesley? I’d have to go with Neelix. (Whose existence I cannot explain, except as an entry into the “worse-than-Wesley” contest that they must’ve been continuously running at Paramount). Call me crazy, but I actually kind of enjoyed this episode. Maybe it was because during the latest rewatch of season 1 that I did, there were so few bright spots, but I thought the Ferengi were much less ridiculous than they were the first time, and I LOVE the idea of Picard having a previous command…it adds such a richness to the character. I also am partial to the Stargazer ship design…its one of my favorites. I suppose all of the critiques are sound, and when you really pour some thought into it, there ar all kinds of problems. But when I compare it to what came before and much of what followed for this season, The Battle was an episode that I could actually enjoy, albeit with a few caveats and blind eyes to grating stupidity. Why are my rants special? So I *do* get Angel One. But at least I don’t get “When the Bough Breaks,” which I had hoped not to watch again. Yeah, I have to add my vote to Neelix. Truly awful character. I found myself grading on a curve and wanting to give this a three. Like so many others this season, the potential is there (Picard has a history! The Ferengi are somewhat threatening! Consequences for moral decisions! ), but the execution is terrible. I think if you deliberately tried to create a character more hate-able than Wesley (which I think I’d actually limit to seasons 1 and 2 Wesley; he got better), you’d wind up creating a huge fan favorite that everybody just loves to hate. Like Dr. Smith on Lost in Space or maybe Neil Patrick Harris’ character on How I Met Your Mother. Someone so utterly reprehensible, he’s fun. You can only get someone as bad as Wesley by trying to create someone who’s perfect and better than everybody and then writing him badly to boot. I don’t know what they were trying to do with Neelix, but what they needed was either a Radar O’Riley (early years version) or the Telly Sevalas character from Kelly’s Heroes. I’m not sure Bob @10 quite applies to Lemnoc’s question. TOS didn’t have replicator technology and they weren’t yet in a post-scarcity economy. I doubt the concept of a post-scarcity economy had even been developed, let alone migrated beyond the walls of economic theory. But that gives a very narrow window for the development of that economy, given that Dr. McCoy was still alive as the series began. Still, they were playing right into all those stereotypes of radical lefties throughout the series. Not just the rather smug anti-capitalism, but smug environmentalism, smug political correctness, smug anti-racism, etc. The key factor here is smug. Like Dr. Smith on Lost in Space or maybe Neil Patrick Harris’ character on How I Met Your Mother. Someone so utterly reprehensible, he’s fun. You can only get someone as bad as Wesley by trying to create someone who’s perfect and better than everybody and then writing him badly to boot. Yes, my point, too. (I gotta yield on the Neelix rebuttal because that character was admittedly terrible and terribly dull, terribly written. But this episode shows The Boy as instantly, massively superior to the entire crew of supposedly the best-manned, talented ship in the galaxy, who breaks the fourth wall to comment on his infinite superiority (“Grown ups!”). Gah. the rather smug anti-capitalism, but smug environmentalism, smug political correctness, smug anti-racism, etc. The key factor here is smug. Agreed. And my comment was not necessarily to validate or honor “The Economics of Star Trek,” but merely to observe that if such a series of advances occurred, such as instant replication-on-demand, they would largely render the last 300 years of economic theory obsolete. Even intellectual property seems a somewhat fickle thing in TNG, with nary a discussion of limits, patents or copyrights. Obviously, there MUST be some scarcity in the TNG era, else why have freighters and traders and idiocies like gold-pressed unobtainium? But obviously a lot of this stuff was not well thought out. I can’t help but like this episode a little. Yeah, I can’t disagree with anything bad that’s said about it–although I confess I never noticed how problematical the timing of the Stargazer incident was until DeepThought pointed it out. 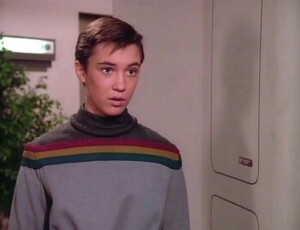 Well, if Wesley Crusher can go from the ship’s doctor’s kid to full ensign in a couple of years, maybe reaching command rank doesn’t take all that much longer. But this time, I realized that the Picard Maneuver is as forced and ludicrous as the rest of the episode. It’s hardly the brilliant military tactic Starfleet makes it out to be, especially if they can come up with a defense against it in about ten seconds–even if it takes an android to do it and foreknowledge that the maneuver is about to be performed. Phew, especially if it took the android to do it, considering that up to this point Data comes across not as a genius but as a booked-up toddler who somehow learned to talk earlier than usual. Thing is, we finally get to see Patrick Stewart act in this instead of merely treat us to speeches, moralizing, and orotund insults against the barbarous 20th century. Stewart almost saves the episode, all by himself. While he might not be believable as a man who somehow forgot about an entire battle (one taught in Starfleet Academy!) until he was reminded of it, he’s entirely believable as a man who’s slowly losing his grip on reality. I’m willing to buy “you’ve earned your pay for the week” as an idiom long since stripped of its literal meaning. except of course in other episodes we are told that there is money. For example we know Lt Uhura was going to buy a Tribble until one was given as a gift. I think we can safely assume from her officer’s pay. The truth of the matter is that at times Star Trek has been money free (“Let me guess, you don’t use Money in the 234rd century.” Kirk: We Don’t.”) While at other time there is a monetary system. The basic world building in trek has always bend dodgy at best, and fans have tended to pick and chose which bits that they like and ignore the bits that they do not. As I pointed out in another thread, credits were mentioned elsewhere in Star Trek. 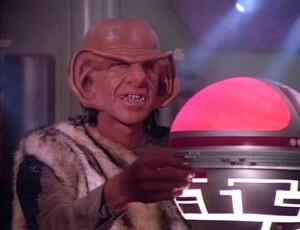 Nog spent many of his transporter credits going to another state for meals while at the Academy in DS9. And in the episode where the staff at Quark’s goes out on strike O’Brian and the Doctor try to convince Warf not to do business there. I read that discussion as being about not spending your money/credits there. And I didn’t buy that bit about headaches being so rare. There is no single cause for all the forms of pain lumped together under the common description “headache” and I can’t imagine every possible cause having been eliminated. I’d forgotten about Uhura and the tribble. I suppose I could come up with the hand-waving explanation that the “Deep Space Station K7” they’re on isn’t actually a Federation installation–note that the station manager, Mr. Lurry, appears to be a civilian and not a Federation man–and that the bartender can charge whatever he likes in whatever form he likes. Or something. Yeah, I admit, it’s rather foolish to try to cram everything into a consistent framework. There’s something about Wesley’s contribution to this episode that didn’t really hit home until just now: what the hell is Wesley doing fooling about with the ship’s sensors? If a kid’s a genius, sure, you might decide to let him into college early, but you don’t permit him to start tampering with all the lab equipment whenever he feels like it. Surely there’s a safer way for Wesley to get his technological freak on? Flipping hell, isn’t that what the holodeck is for? I thought it was weird that no one had gone looking for Stargazer too. Memory Alpha pointed out that one of the novels establishes that Picard aimed the ship into a gas giant, but it didn’t make it. It probably would have made more sense to set it to self-destruct, if that wasn’t somehow disabled. I can’t imagine it’s good protocol to leave a Federation starship drifting in space, especially near enemy territory. Ha! It does seem like Troi always has an excuse for why she didn’t notice something. I’m trying to remember if she ever does contribute anything useful. It’s a little better when she is later shown as a pyschologist, but she does feel fairly superfluous, especially in the command structure. Also, re: money, there was a line in Catspaw that stuck out: “Maybe we can’t break it, but I’ll bet you credits to navy beans we can put a dent in it.” But that also could have been just a saying, particularly since they probably didn’t have navy beans. Flight of the Phoenix? Which episode was that? It probably doesn’t come across with the snark, but I did enjoy the episode, but they pay me to pull these things apart. (“Pay” in the Starfleet sense, as in I’m rewarded with the satisfaction of doing the job.) That’s why I mentioned I had a soft spot for it. Like Torie, I almost rated this higher, especially since it is better than “The Last Outpost,” but I’m trying to reign in my enthusiasm. The only character worse than Neelix was Tuvix. Are you really not going to re-watch some of these if you don’t have to review them? What kind of an example are you trying to set here? Memory Alpha also pointed out that they used the old warp effect for Stargazer instead of the TNG rubber band effect, which is a nice little detail that had escaped my notice. We’re not there yet, but I rather liked Tuvix. He was surprisingly and refreshingly selfish. The standard ST line would be that he would gladly sacrifice himself to save two others. But he didn’t. Refreshing. The Voyage episode with Neelix fixing the space elevator. Count me as another one who rather enjoyed this, despite its flaws. Another thing which doesn’t really seem plausible – it’s implied that this is the first time anyone has seen the Stargazer‘s computer records, such as Picard’s log, since the crew evacuated. Now, if I were forced to abandon a very expensive starship which was under my command, I would want to bring along any evidence I could to justify my conduct at the subsequent enquiry – including, at a minimum, copies of sensor data from the battle and recent log entries. (And if I were Starfleet, I’d make this standard practice.) Maybe in 1987 they figured there wasn’t room in the shuttlecraft for that many floppies AND the whole crew, but in 2012 it’s impossible to believe they wouldn’t have enough portable data storage to take the logs with them. Iudon @ 20: And I didn’t buy that bit about headaches being so rare. There is no single cause for all the forms of pain lumped together under the common description “headache” and I can’t imagine every possible cause having been eliminated. I agree. The funny thing is it seems like Picard doesn’t buy it either. PICARD: It’s just a headache. CRUSHER: This is the future! Headache is a rare and alarming symptom! What’s hysterically funny about the “headaches don’t exist any more” plot detail is that, rather than make the doctors OF THE FUTURE look better than 20th century leeches, it makes the doctors of the future look worse. I’d be a lot happier about telling my 20th century local clinician about a headache than telling Dr. Crusher. At least the clinic doctor wouldn’t seem so damn helpless, I’ll be bound, even if he was just writing out a bored prescription for Tylenol 3s. Next thing she’ll be telling him is that male pattern baldness is a rare and alarming symptom. I think I actually owned that shirt of Wesley’s in the 70s, or one very much like it. In this episode is one of the few nods to the fact that funny things must happen with FTL–yet the “Picard Maneuver” can’t be a bit of genius, it’d have to be more or less accounted for since the first instances of warp-capable ships. I bought Data’s solution as an expedient made possible by the (presumably) huge difference in available power between the two ships. The sledgehammer solution, if you will. I didn’t especially like Stargazer’s design, or her name, but it was good to see some indication that there were decades of engineering between The Search for Spock and TNG.